I’m writing this from behind a stall on my second day at a craft fair while Mr LLL catches up actually making orders. I have a single peanut butter and cheese sandwich to sustain me through the day because I forgot to grab breakfast, and if you’d like to join in the debate as to what exactly constitutes a sandwich then pop over to my Instagram stories! But before you do, this week I…. This year, as something of an experiment, Mr LLL signed up to take Reginald Spleen out to some craft fairs. This seemed like an excellent idea when it was a bit quieter. 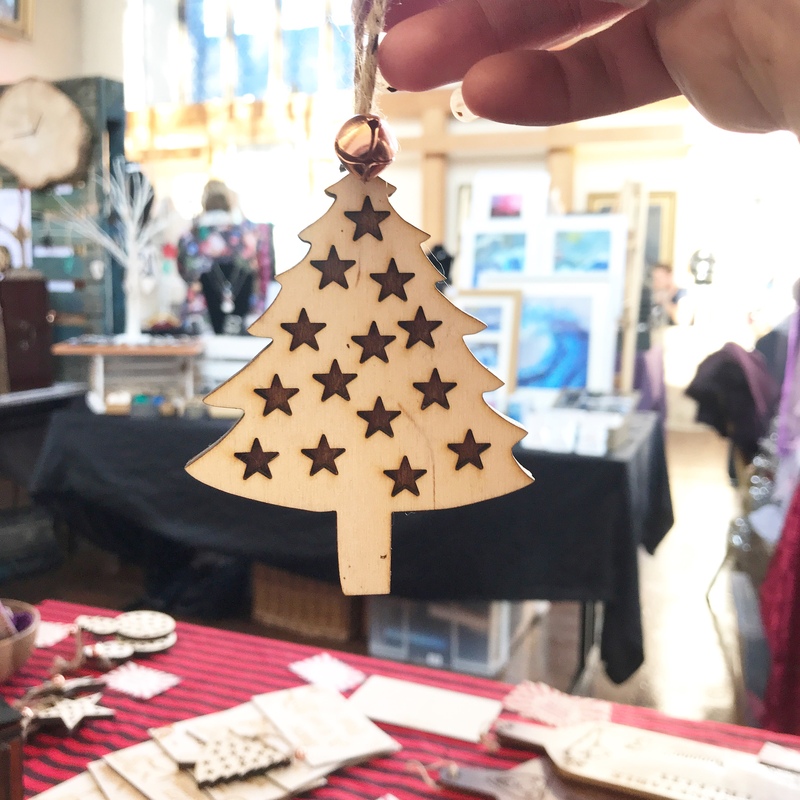 Then everyone started Christmas shopping and suddenly making things for a fair meant staying up late and me doing crafty things to help out, which is not my favourite thing (understatement of the century). 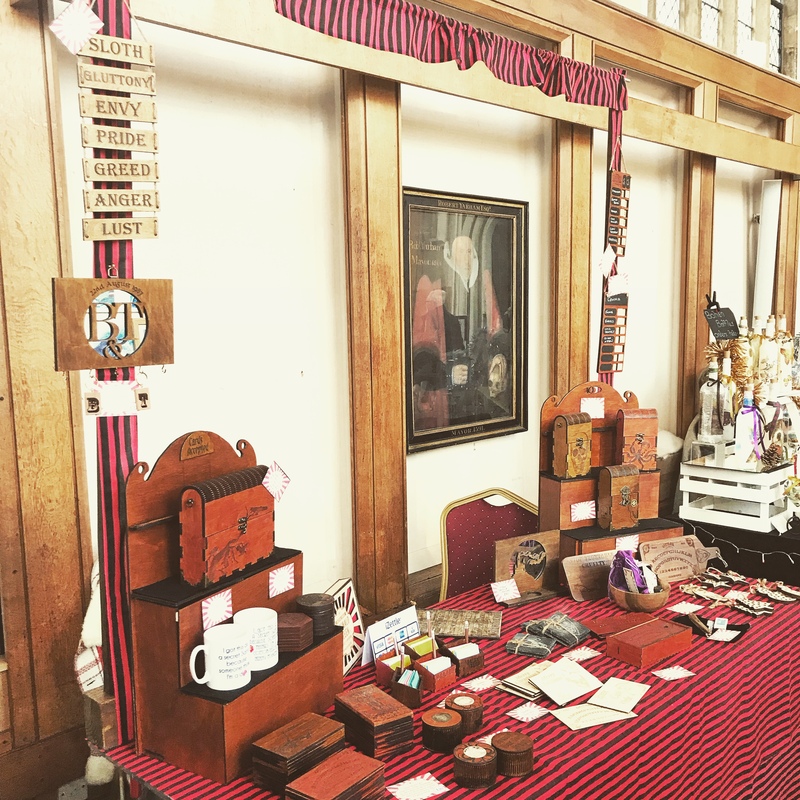 In order to free up Mr LLL to do the crafty stuff he actually IS good at, I have therefore spent the last 2 weekends sat behind a stall talking to people about wooden boxes. Which is where I am right now, in the lovely bright Blackfriars Hall. I made these (well I glued them together and put the bells on) I’m quite proud. Spoiler, I didn’t, but there was an exciting few minutes where I thought I might. I ordered a case of wine with a voucher from Naked Wines. I received an email telling me my wine would be delivered that day. 20 minutes later there was a knock at the door and my wine arrived. For a few brief and exciting minutes I thought maybe another case would turn up tomorrow. Not that I’d keep it you understand, well, probably not, the guilt would kill me. Fortunately I was saved from that dilemma as 20 minutes after that I received this email. So, no free wine, but what an exciting 20 minutes that was. Thankfully it tasted good as well as being rainbow coloured, because that means I can buy them again, and it’s def because they taste good. 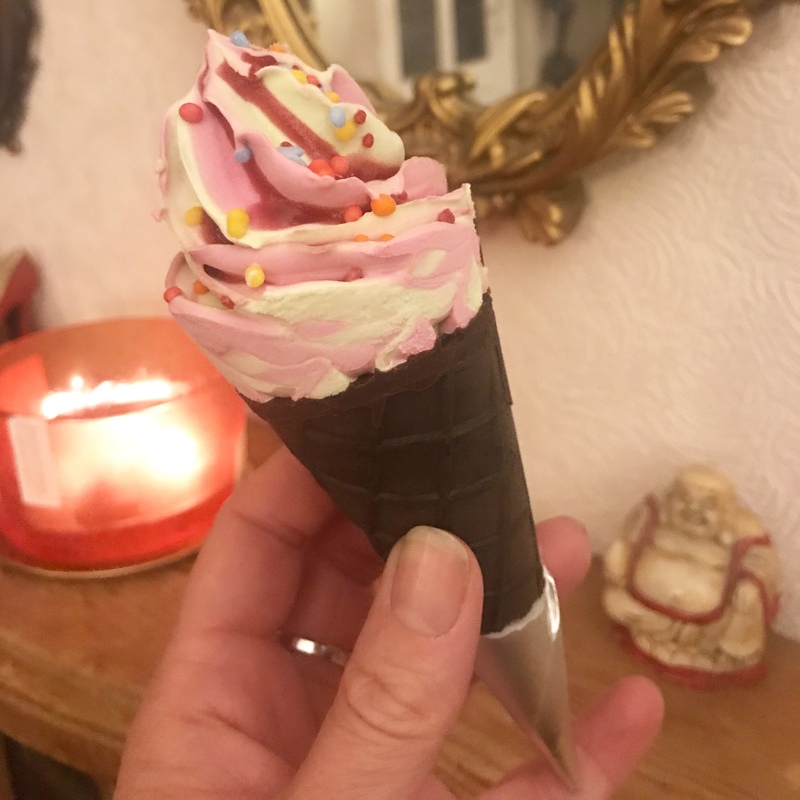 Not because they are uni-cones. Oh no. Our wedding anniversary is on the 12th November. 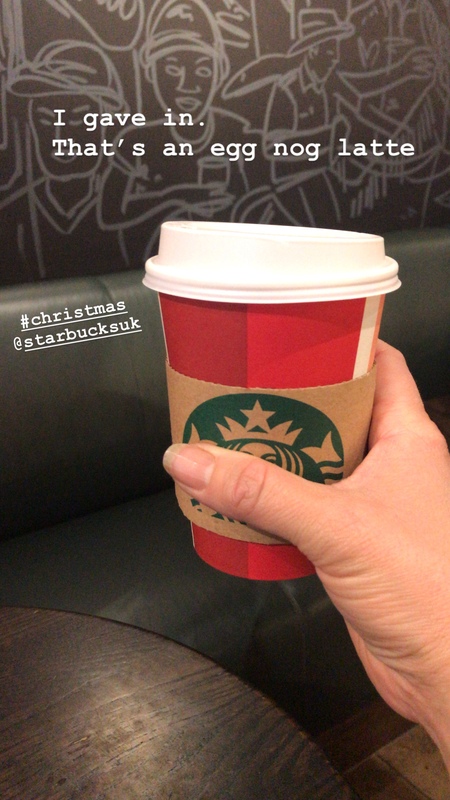 Every year I swear I will not start Christmas until after that, and every year I cave and have an egg nog latte, or a Christmas sandwich, or something else festive in early November. Last week I treated myself to a coffee and managed to resist the lure of a festive latte. This week I caved and had an egg nog latte. I mentioned that I spent all day yesterday talking to people about wooden boxes? I find human interaction quite tiring at the best of times, but I also did yesterday on 4 hours sleep because Peppa had a poorly tummy and I kept getting up to check on her. By the time I got home last night I was ready to drop, which I did, onto the sofa, under my coat because I was cold. Thankfully Mr LLL was on hand to take photos and laugh at me. 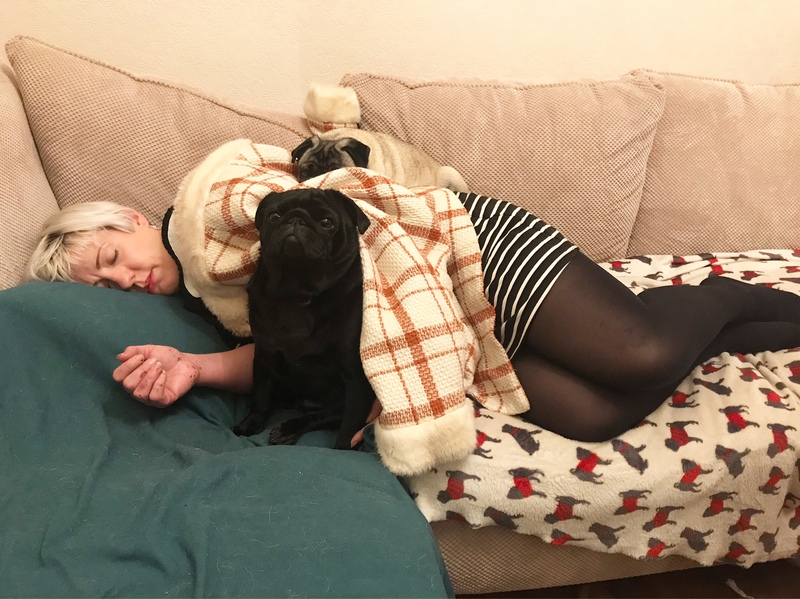 A nicer person might have swapped my coat for a blanket, just saying…..
Ps, it might be tempting to think the Pugs are being loving and guarding me while I sleep. But don’t be fooled, it was 20 minutes from dinner time and I suspect they were just hoping I’d wake up feed them. Gosh what an uneventful week that was. I promise I’ll try harder next week. Oh, while you’re here, my amazing friend Kelly has a very worthwhile project in the Aviva Community Fund this year. She’d really appreciate a vote or two!